When it comes to snacks that easily can be considered a meal, tot-chos are pretty high on the list. 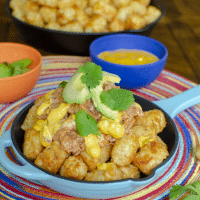 What’s more fun than tater-tot nachos? I’m going to go with gluten-free and dairy-free totchos that taste amazing and will leave most people shocked to find out there is no wheat or dairy! This is a fun and easy-to-make game day recipe that can be served while watching college basketball games with friends and family. The combination of crispy tots, barbecue sauced chicken, dairy-free homemade cheese and other toppings is sure to please even the pickiest of palates. Thank you to Curly’s for sponsoring this post. When it comes to game day food, I like to make it more of a DIY kind of food bar so everybody can have exactly what they want on their totchos. I find people enjoy this the best and it’s less fuss for the person in the kitchen. This way, you just gather all of the ingredients, once prepared, into different bowls and people help themselves. This even works well with the kids! You put the Tots in the Totchos. I started cooking the tater tots in the oven to get them nice and crispy. Most people like them cooked a little longer than most directions state so they start out crispy. I also prefer to cook them in the oven over deep-frying them. While the tots are cooking I get my dairy-free cheese sauce started. I’m not a big fan of pre-packaged dairy-free cheese, but of course, you can use that, or use the full-fledged dairy version. I’ve shared my dairy-free cheese sauce recipe before, the only difference here is that I omitted the ground beef and black beans. These left for a more authentic nacho cheese sauce typical to what you would find on traditional nachos. This whole recipe (minus the soaking of the cashews, which I don’t even think is necessary) takes less than 10 minutes, tops. While I make my own cheese, the BBQ pulled chicken with sauce was much easier as a grab and go. Curly’s Sauced Chicken can be found in the refrigerated meat case in your grocery store. Since it’s already cooked, and all white meat with sauce on it, all you will have to do is heat it up and it’s ready for the DIY totcho bar, or any other meal! Also, for a limited time, there will be a $1 OFF coupon available on Curly’s packages in-store. Be still your coupon loving heart! Once the tater tots are cooked, your dairy-free cheese is all ready, the chicken is heated and your toppings are made, it’s time to get to constructing your totchos. 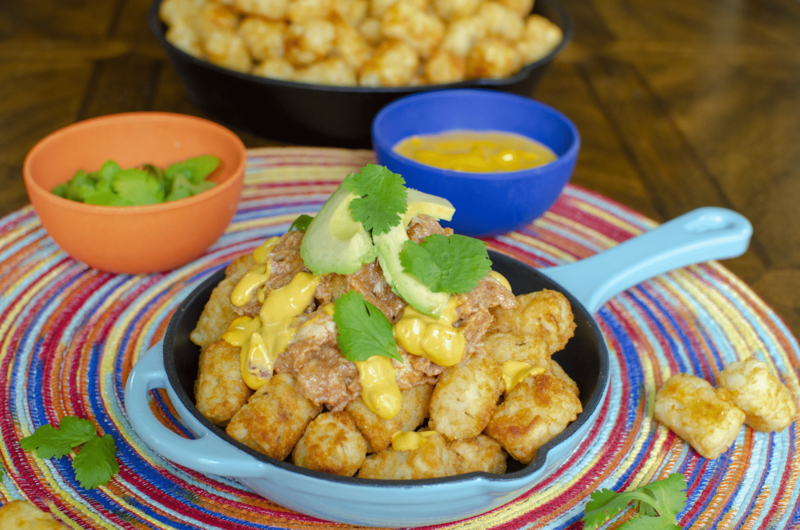 There are a plethora of choices when it come to topping your totchos, but we kept things simple with a layer of cooked tater tots, followed by some Curly’s Pulled Chicken, dairy-free cheese, avocados and cilantro. You could always add tomatoes, jalapeños, and many other options. However you decide to construct yours, put it in a fun miniature and personalized cast-iron skillet or small bowl so each person has their custom dish of totchos to enjoy. These totchos were quite the hit with Mr. Serious! Even when he wasn’t quite sure what to think of the dairy-free aspect, but he’s quite enjoyed them as have the girls. 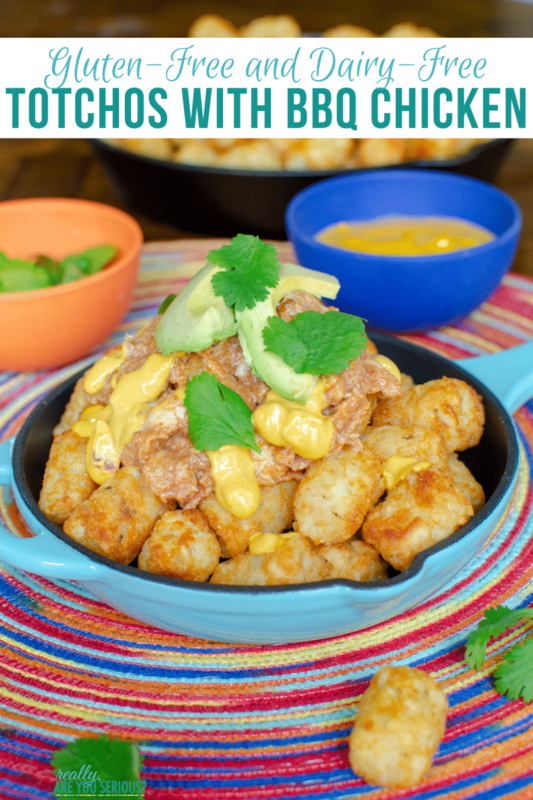 A tasty and savory gluten-free and dairy-free version of your favorite totchos recipe with BBQ Curly's Sauced Chicken. Various other toppings like tomatoes, jalapeños, etc. Prepare your tater tots as instructed on the package. While the tater tots are cooking, create your Dairy-Free Cheese Sauce (hold the meat and beans, or don't, your choice). Once the tater tots and cheese are finished, heat your BBQ Curly's Sauced Chicken. 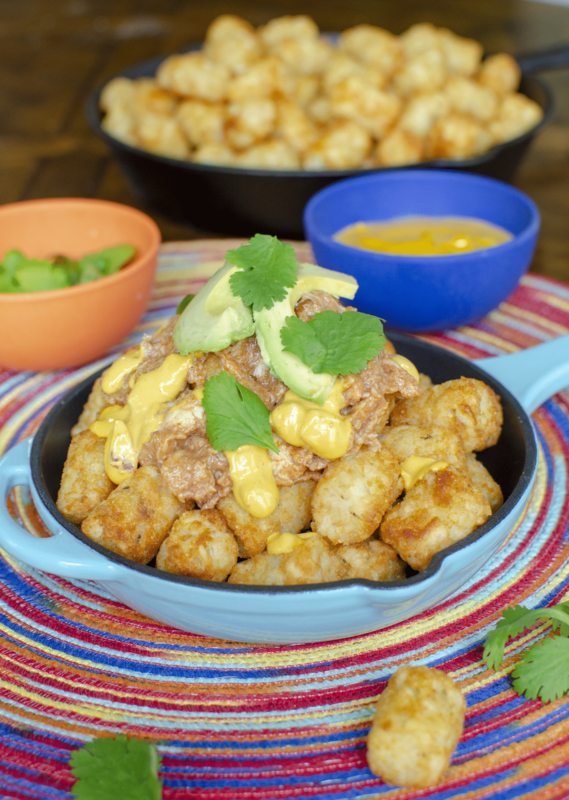 Create your totchos by placing a layer of tater tots into your personal dish. 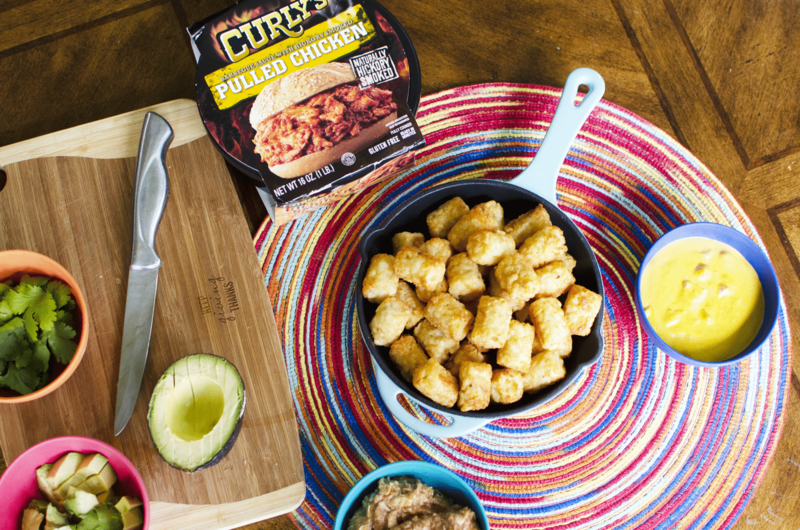 Then, layer dairy-free cheese, BBQ Curly's Sauced Chicken, and toppings of your choice in a cute personalized cast-iron skillet or small cooking sheet. Nutrition information isn’t always accurate. Provided information is for the tots, meat and cheese. Toppings add extra. All of the crowds! With 6 different tastes in our house, I like to make it DIY so everybody gets what they want on theirs! MOAR sauce and cheese! Pile high the MEAT!